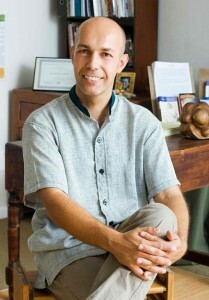 Andri has also pursued additional training in cranio-sacral techniques, visceral manipulation, and Rolf movement techniques. Andri believes that one of the most powerful influences that affects the potential of the mind is a balanced, flexible, mobile, healthy and energetic body. Andri works with people of all ages to reduce the burden of gravity and create ease in function. This is a unique form of bodywork that reorganizes the connective tissues, called fascia, that permeate the entire body. Rolf practitioners, known as “Rolfers”, view the body as a system of seamless networks of connective tissues that surround, support and penetrate all of the muscles, bones, nerves and organs. Rolfing techniques work on this web-like complex of connective tissues to release, realign and balance the whole body. The Rolfing process enables the body to regain the natural integrity of its form, thus enhancing postural efficiency, freedom of movement and relief from chronic pain.